The brewer could increase output tenfold with a new €4 million facility, due to open next year. DESPITE A €4 million brewery project that could see its output increase tenfold, Wicklow Wolf has no ambition of fighting with the multinational brewers for a slice of market share. The brewery’s co-founder, Simon Lynch, said “there’s a lot of noise in the industry” with an ever-growing number of craft brewers and major producers with ‘craft-beer lite’ offerings. “You can only jump up and down and wave your hands so much. We let our beer do the talking,” he told Fora. Wicklow Wolf was founded in Bray in 2014 by Lynch and Quincey Fennelly, and now employs around 20 staff. However since it was launched, the craft beer market in Ireland has exploded. According to the Drinks Industry Group of Ireland, the number of craft breweries in Ireland has quadrupled since 2012, with total turnover in the sector reaching €52 million in 2016. The drinks giants have also jumped on board the trend, launching mass-produced craft-style beers, such as Guinness’s Hop House 13 and Heineken’s Cute Hoor. 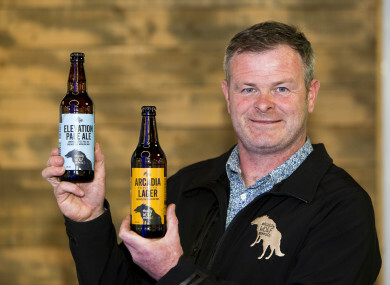 In the face of the stiff competition, which has already forced some small, start-up brewers to close, Lynch said Wicklow Wolf is determined to maintain its premium offering. “There has been a tendency for others to drop prices. We decided that we can’t afford to do that, but some other craft breweries are trying to compete with the likes of the larger breweries,” he said. Lynch said that Wicklow Wolf was “one of the more expensive beers” on the market, with bottles retailing around the €4 mark, but he added that “people are prepared to pay that little bit extra for something they enjoy”. At the moment, the key focus for Wicklow Wolf is on its new €4 million brewery in Newtownmountkennedy – not far from its current Bray base – which Lynch expects to be up and running by May or June of next year. “The number-one reason for the new brewery is that it will give us a greater capacity. At the moment we’re so strapped for space in the existing brewery that we haven’t got the possibility to export in any major way,” he said. According to Lynch, Wicklow Wolf currently exports around 10% of its beer and has only “dipped its toe” into markets such as France, Italy and Denmark. However, once the new brewery is operational, the team plans to target new markets, such as the Nordic countries, Canada, Spain and potentially China, with exports accounting for “a lot more of the business” going forward. Lynch said that the new 35,000hl brewery will allow Wicklow Wolf to produce eight to 10 times more beer than it is currently brewing. The facility has been funded by around €3.7 million of investment from the Halo Business Angel Network, Enterprise Ireland and private investors. “It’s a big step change for us. Obviously we’ll scale up as we go along. We’ll have the brew house, which is the engine of the brewery, but we can add fermentation tanks as we increase with our new markets and tap into new sales streams,” Lynch said. The company also plans to grow other revenue streams by increasing tours as part of the shift to the new brewery. Lynch said there was a “huge appetite” from both locals and tourists for brewery visits, while Wicklow Wolf will also take advantage of new legislation passed earlier this year to allow producers to sell beer to the public from their brewery sites. “Phase two of our plan on the Newtownmountkennedy site is for a purpose-built building for tastings, food pairings, talks. Allowing people to taste our wares, hear our story,” he said. “That’s the reason we chose this site – it’s two acres, and it gives us scope to expand not only production but also build a visitor experience. Although Wicklow Wolf has been operating for nearly five years, Lynch said that he and Fennelly had stuck to the same plan they first had after completing a joint Bord Bia, Enterprise Ireland and Teagasc-run Food Works accelerator programme. “We made a decision early on that we didn’t just want to be a small brewery. We had a strategy to produce beers for the locality to begin with, then roll it out nationally, and then look at international markets and exports when we were ready,” he said. Lynch added that the business had “exceeded expectations” in Ireland so far. Last year Wicklow Wolf produced around 7,000hl of beer and recorded turnover of more than €1.3 million. The brewery produces six core beers as well as a range of seasonal and collaborative brews, which it distributes to 1,000 off-trade and 200 on-trade locations around Ireland. As a way to kick-start its international expansion, Wicklow Wolf has been collaborating on beers with other breweries in Europe. Recently, it teamed up with Denmark’s Anders Kissmeyer and London brewery Anspach & Hobday. “It’s a great way for us to experiment and grow. It opens up people in Ireland to new breweries from around the world and vice versa, so it will help us in new markets overseas,” Lynch said. “We’re not just leaping off the cliff going into new markets. We’ve already started relationships, we’ve been to international trade shows and festivals, trying to line business up for when we have the capacity to be able to produce more. Email “'You're either premium or you're not': Why Wicklow Wolf won't compete with the beer giants”. Feedback on “'You're either premium or you're not': Why Wicklow Wolf won't compete with the beer giants”.